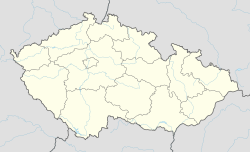 Mladá Boleslav (Czech pronunciation: [ˈmladaː ˈbolɛslaf]; German: Jungbunzlau; meaning "New (or literally Young) Boleslav") is a statutory city in the north of the Czech Republic, on the left bank of the Jizera river about 50 kilometres (31 miles) northeast of Prague. It is the second biggest city in the Central Bohemian Region and a major centre of the Czech automotive industry (Škoda Auto). The city name abbreviation MB became eponymous for colloquial naming of Škoda cars (especially in the communist era) as "embé(čko)". Founded in the second half of the 10th century by King Boleslav II as a royal castle. Because there already was a castle known as Boleslav near Prague, this new castle was named Mladá (young) to distinguish it from the older Boleslav, which became known in the 15th century as Stará Boleslav (Old Boleslav). The town received partial city rights in 1334 and 1436, becoming an important site on the road from Prague to northern Bohemia, Lusatia, and Brandenburg. In the 16th century the town was a leading centre of the Unitas Fratrum / Unity of the Brethren / Moravian Church, hosting the Brethren's bishop, Renaissance church, and printing house. After being re-Catholicized in the 17th century, the town's population declined. In the 17th and 18th centuries, Mladá Boleslav (called Bumsla by Jews) was an important Jewish center. In the 19th century (in fact, the period of decline of the Jewish community), Mladá Boleslav was dubbed "Jerusalem on Jizera". In 1634, Jacob Bassevi von Treuenberg (born 1580 in Verona, Italy), the first ennobled Jew in the Habsburg monarchy, was buried on the Jewish cemetery in Mladá Boleslav. In the 19th century new prosperity came: the town became an important regional centre as new schools, theatres, museums, and the Laurin & Klement (today Škoda) automobile factory were founded. Since the 1990s the factory is making it one of the richest and most prosperous Czech towns. Adina Mandlová (1910–1991), actress, was born there. Mila Rechcigl (born 1930), scientist and long-term president of the Czechoslovak Society of Arts and Sciences (SVU) was born here. The local football team FK Mladá Boleslav plays in the Gambrinus liga (top national division), four times qualified for the Uefa Cup and European League, beating such opponents as Olympique de Marseille 4-3 on aggregate in 2006 or US Citta di Palermo 2-1 on aggregate in 2007. The local ice hockey team, BK Mladá Boleslav (Bruslařský klub), relegated in 2012 from the Extraliga, but quickly returned in 2014 and is set to participate in the 2014–15 Czech Extraliga season. ^ Spector, Shmuel; Wigoder, Geoffrey (2001). "The Encyclopedia of Jewish Life Before and During the Holocaust: K-Sered". NYU Press. p. 832. ISBN 9780814793770. Wikimedia Commons has media related to Mladá Boleslav. Wikisource has the text of a 1911 Encyclopædia Britannica article about Mladá Boleslav.